At CHOC Children’s, we specialize in offering cochlear implants, a revolutionary treatment for infants, children and teens who have profound hearing loss. The CHOC Cochlear Implant Program is designed to give your child the support they need to hear and communicate effectively. As part of the Orange County Cochlear Implant Institute™ in collaboration at Providence Speech and Hearing Center, CHOC is part of a dedicated team that includes otolaryngology (ENT) specialists, audiologists, speech-language pathologists, a psychologist and a social worker. CHOC and Providence offer all of the services needed for a successful cochlear implant. Surgical implantation of the device by a CHOC board-certified otolaryngologist who has special expertise in pediatric head and neck surgery. Learn more about having surgery at CHOC. Highly specialized speech and language therapy to help a child adjust to the implant and learn to understand language and communicate effectively. Penelope Grand had normal hearing from the day she was born. She loved to dance to music and she was easily woken by noises. Her parents, Luci and Paul, anxiously awaited her first word. Then, when she was about 10 months old, something changed. “I stood right in front of her crib and I called out her name, I clapped, but I got no response from her,” mom Luci says. 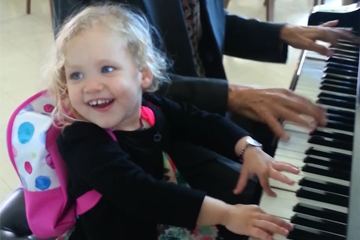 Find out how a cochlear implant changed Penelope’s life. A cochlear implant is a small, complex electronic device that can be implanted to gain a sense of sound. It has two main parts: an external portion sits behind the ear, and a small device is surgically placed under the skin just above the ear. The internal device includes thin electrode wires that are threaded into the inner ear to the cochlea, where they stimulate the nerves that perceive sound. 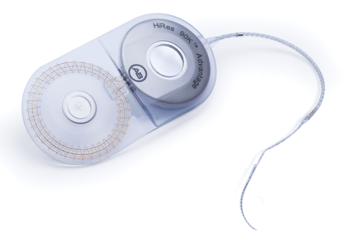 A cochlear implant is different from a hearing aid. A hearing aid makes sounds louder and usually is beneficial for a person who has some hearing abilities. A cochlear implant can help a person with very little or no hearing. The implant doesn’t restore or cure hearing. Instead, it allows a person to perceive the sensation of sound. When coupled with therapy, cochlear implants can help young children acquire speech, language and social skills. Most children receive implants in their first few years of life. 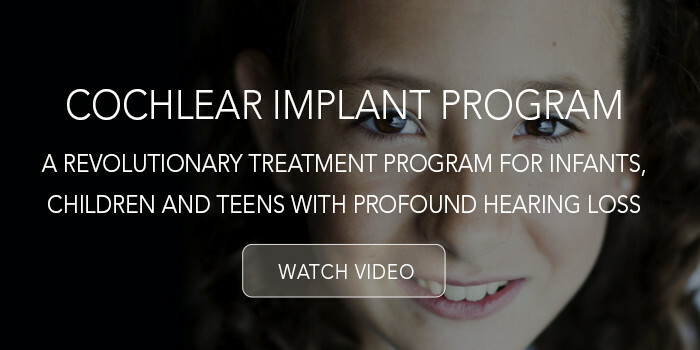 Children as young as one year are candidates for implant surgery. The earlier they’re implanted, the greater the opportunity for exposure to sounds that can be crucial as children learn to talk. Older kids, and even adults, may also receive cochlear implants. Patients may be asked to try hearing aids for at least three months before consideration for a cochlear implant. How will my child be able to hear with a cochlear implant? Most children who meet our implantation criteria will benefit greatly from their device. At first, the sounds they perceive will have a mechanical quality. With intensive post-operative training and therapy, many children are then able to develop speech and hearing that is at near normal levels. As with any surgery however, individual results will vary. What are the risks of a cochlear implant procedure? Implantation requires a procedure under general anesthesia, which carries some risk. There is a slight risk after the procedure for dizziness, infection, ringing in the ear and rejection of the implant. Other possible side effects could include temporary or permanent nerve damage to facial muscles or the tongue’s taste sensation, though this is rare. For most children, the odds of complications are extremely low. Your child’s doctor can explain the risks, and how likely they are to be outweighed by the benefits of implantation. About one month after the surgery, the external parts of the cochlear implant will be activated at Providence Speech and Hearing Center. These include a microphone and speech processor. This is when the implant is programmed and turned on. The external parts work with the internal part of the implant. You will also learn the basics of using and caring for the implant. You may need to return for several visits over a few days for initial adjustments. Further fine-tuning may take place over several months. This process is called “mapping” and helps customize the implant to a child’s specific hearing needs. Learning to use a cochlear implant is a gradual process. It will likely require visits with speech-language pathologists, audiologists, counselors and teachers. But with commitment, a child can experience an improved quality of life with a cochlear. Please contact CHOC Children’s Specialists Otolaryngology to schedule a consultation about your child’s hearing needs.